Former Finance minister Ignatius Chombo and fired Zanu PF youth leader Kudzanai Chipanga, will today appear at the High Court where their bail appeals are set to be entertained, three weeks after they were arrested by the military in an operation meant to weed out alleged criminals within the ruling party. 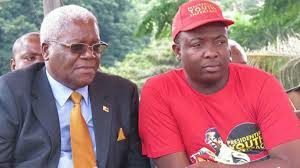 However, Chipanga, who is in custody over allegations of communicating falsehoods, has denied the charge, saying he simply expressed his political opinion when he read the statement which led to his political demise, while Chombo is facing a plethora of charges, among them, fraud, criminal abuse of office and corruption. Chipanga, who is currently being held at the Harare Remand Prison, made the remarks in his bail statement, through his lawyer, Lovemore Madhuku. Chipanga said he did not deny reading the criminalised statement, but that when he read it, he was simply expressing his political opinion and that the very statement was not covered by any sections of the law. “The appellant [Chipanga] does not deny reading the statement in question. He said as much in his warned-and-cautioned statement. His statement is all over the world. His defence is one of law. He has two principal legal arguments that will destroy the State’s case,” Madhuku said. “Firstly, the statement is not covered by the sections of the code cited. It cannot be false. It was an expression of a political opinion. The charge is invalid. Madhuku further said Chipanga’s continued incarceration and the charges were an infringement of section 61 and 67 of the Constitution, adding the matter would soon be referred to the Constitutional Court. “Further, given, reporting conditions, the police will be able to monitor the activities of the appellant if necessary. The learned magistrate ignored the fact placed before her that the appellant had been expelled from his political party and was no longer the youth leader,” he said, adding in Chipanga’s case, no witnesses were required. Turning to the issue of Chipanga’s safety, Madhuku said: “There is no evidence of a public outcry, but that is not the point.